Check out my new video on the Ripley's Mermaids at the bottom of this page! I really dig mermaids. Weeki Wachee Springs and its genuine mermaids is one of my favorite Roadside Attractions. Check out my my previous post on Weeki Wachee HERE and my video HERE. But it turns out that Weeki Wachee is not the only place you can watch mermaids. 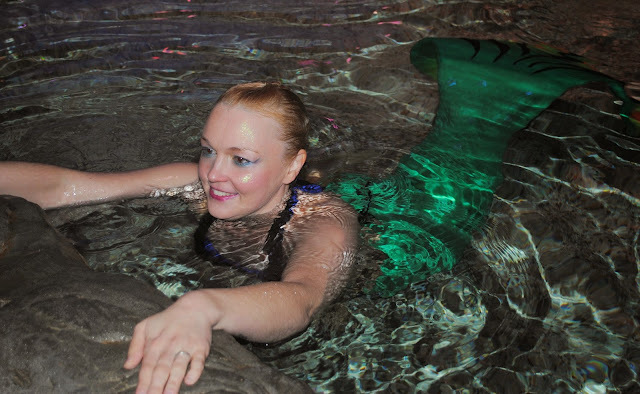 Previously, the Weeki Wachee mermaids would do guest appearances at Ripley's aquariums across the country. Apparently, Ripley's liked the idea and decided to keep mermaids as a permanent part of their attraction. The mermaids here are not branded as Weeki Wachee mermaids, but rather simply called Ripley's Mermaids. So how do the two mermaid shows compare? They both have their unique charms. The Weeki Wachee show earns major points for taking place in an actual natural spring, that can include surprise appearances by turtles, Manatees and alligators. The Ripley show takes place in an artificial fish tank, however it is full of freaking sharks, so that is pretty awesome too. The one major edge I have to give to Weeki Wachee is their trademark breathing apparatuses. This allows the mermaids to stay under water indefinitely without drowning. The Ripley's Mermaids have no breathing devices, so they have to resurface constantly, so they don't die. This my not sound like a big deal, but the Ripley's mermaids essentially gulp air, drop down and do a trick, then resurface for air. This kinda breaks up the flow of the show.